Garlic mustard has invaded Ontario. Learn how to control it! Garlic Mustard has rapidly become one of the most invasive plants we’ve ever seen in Ontario. It spreads aggressively by seed so the time to deal with it is in spring before more seed is distributed! Garlic Mustard is an invasive herb native to Europe. It was brought to North America in the early 1800s for use as an edible herb. Available in the early spring and high in vitamins A and C, it has a strong, distinctive smell similar to garlic. Since its arrival in North America it has escaped into the wild and is now one of Ontario’s most aggressive forest invaders. Garlic mustard has two distinct life stages over its first two years. In the first year, it grows only a cluster of leaves shaped like a rosette, while a strong root system develops. Plants that survive the winter produce flowers and hundreds of seeds in their second year. Dense stands produce more than 60,000 seeds per square metre. Stands of garlic mustard can double in size every four years. 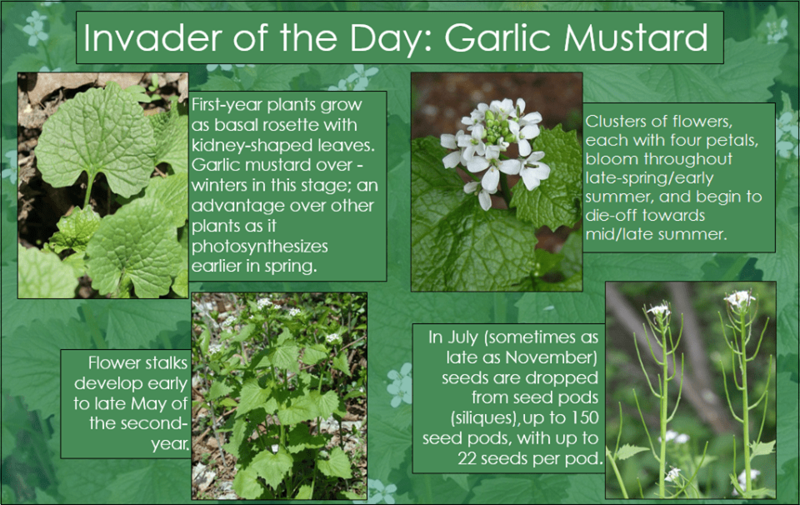 Garlic mustard seeds are easily spread by people and animals. They can remain in the soil for up to 30 years and still be able to sprout. The plant can grow in a wide range of sunny and fully shaded habitats, including undisturbed forest, forest edges, riverbanks and roadsides. Garlic mustard does not provide a valuable food source for native wildlife. Garlic mustard is established in southern and eastern Ontario as far north as Sault Ste. Marie, in parts of Quebec, and south to North Carolina and Kentucky in the United States. Isolated populations have been found in British Columbia, Nova Scotia, Prince Edward Island and New Brunswick. Garlic mustard can invade relatively undisturbed forests. Once established, it can displace native wildflowers like trilliums (Trillium sp) and trout lily (Erythronium americanum). It hinders other plants by interfering with the growth of fungi that bring nutrients to the roots of the plants. The plant threatens several of Ontario’s species at risk, including American ginseng (Panax quinquefolius), drooping trillium (Trillium flexipes), false rue-anemone (Enemion biternatum), hoary mountain mint (Pycnanthemum incanum), white wood aster (Eurybia divaricata), wild hyacinth (Camassia scilloides) and wood poppy (Stylophorum diphyllum). Young leaves release a strong garlic odour when crushed. First-year plants produce a rosette of dark green, kidney-shaped leaves with scalloped edges. Second-year plants grow a stem 0.3 to 1.2 metres high with triangular, alternate, sharply toothed leaves. Lower leaves are broad, kidney-shaped and up to 10 centimetres across. Upper leaves are triangular and five to 10 centimetres across, narrowing towards the tip. Second-year plants produce white flowers with four small petals in May. Narrow seed pods 2.5 to six centimetres long split open in mid-summer to reveal tiny black seeds. Garlic mustard resembles several native Ontario plants. The leaves at the base of the plant look like those of several plants in the carrot family (Thaspium and Zizia), the daisy family (Senecio) and the violet family (Viola). The seed pods look like those of several other mustard (Brassicaceae) species. The easiest way to distinguish garlic mustard from these plant families is to crush the leaves. If they emit a strong garlic smell, then the plant is most likely garlic mustard. Learn how to identify garlic mustard and other invasive plants. Learn how to effectively manage dog-strangling vine on your property. The guide to Best Management Practices for Garlic Mustard descirbes the most effective and environmentally safe control practices for this species. Avoid using invasive plants in gardens and landscaping. Buy native or non-invasive plants from reputable garden suppliers. Native plants provide habitat and food sources for native wildlife. See Grow Me Instead: Beautiful Non-Invasive Plants for Your Garden. Dispose of invasive plants in the garbage. Do not put them in the compost or discard them in natural areas. Discarded flowers may produce seeds. When hiking, prevent the spread of invasive plants by staying on trails and keeping pets on a leash. If you find garlic mustard or other invasive species in the wild, please contact the Invading Species Hotline at 1-800-563-7711, or visit EDDMapS Ontario to report a sighting. A life-long nature and plant lover. Active with London fanshawe hort for 11 years and a master gardener with London Middlesex Master Gardeners since 2011.